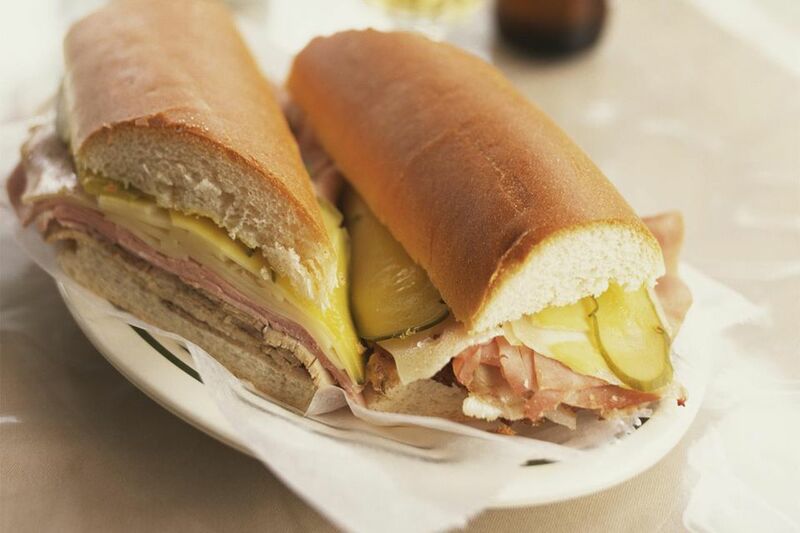 Cuban sandwiches (Cubanos or "sandwich mixto") are marvelous things consisting of roast pork, ham, salami (sometimes), dill pickles, Swiss cheese, and yellow ballpark mustard. It's built on a bread similar to Italian and then grilled. In this case, I used Dijon mustard instead of ball-park and Spanish Mahon instead of Swiss, but it's the pork marinated in citrus juice that makes this sandwich particularly distinctive. 1. Slice bread in half lengthwise and then in half horizontally. Butter outside faces. 2. Spread mustard on inside faces and layer each sandwich with 1/2 of remaining ingredients. 3. Place sandwiches in a large skillet or griddle, lay a cake pan or baking sheet on top and weigh it down to flatten sandwiches. 4. Set stove to medium low and cook until bottom is well-browned and crisp - about 6 minutes. Turn sandwiches over, restore weight, and cook another 3-4 minutes. Serve. Note: Instead of a frying pan or griddle, I use my grill pan which I preheat over medium heat until hot. This is non-traditional, but I like it.